What really chaps your nads? flat-bill for like ten years running. 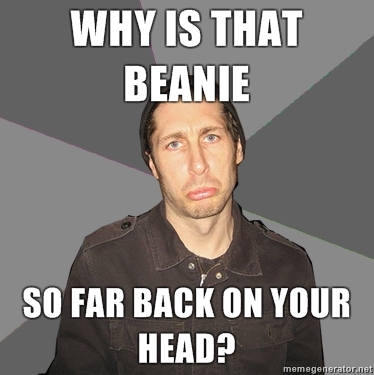 but what's a barely beanie? ashton kutcher is not the right person. I wish I could be more of a hat person, but most hats do not look good on me (largely because my ears kinda stick out and are very inflexible?). I need more options besides my signature cadet hat. Been thinking a beanie that actually fits (not floppy on top) and stays above the ears would work, but this is apparently hard to find (and ordering hats online is as bad as pants/shoes as far as not knowing if it will fit). Most hats are pretty bad, but none are as bad as the word "beanie"
Hats are such a minefield of negative cultural associations. you're looking for a "watch cap". Thanks, I think I need a hat glossary. I'm afraid this would push things into "drum & bass dj" territory. sanpaku, any way you can offer us some background info? is what you're posting related to what you do professionally or are you just obsessed with numbers and a malthusian outlook? also, do you own a fedora? I don't own a fedora. I bought a straw panama hat in Havana that is similar, but I haven't worn it out. There's a banknote for Vietnamese Dong (colorful but worthless) where a feather should be in the hat band. The only hat I wear with any regularity is a beret made by Boinas Elosegui of Tolosa, Spain, which strikes me as ideal minimalist headwear for colder seasons. Bitter cold: pull it down past one's earlobes. Walking towards the rising sun? Pull it the ample fabric forward to shield eyes. I code professionally. I've degrees in biochemistry, history and computer science. But most of my income has come from investments, which keeps me apprised of global news. Malthus had some silly ideas about arithmetic growth, but I think everyone should read his Essay. Not just because Malthus + Lyell = Darwin, but because its well written, and he should be remembered as a realist humanitarian of his day. I don't particularly enjoy TV. I'd much prefer spend my evenings digging into primary research literature. Most of the time, its things around the nexus of nutrition/biosciences/experimental gerontology. I could talk your ear of about postprandial metabolic endotoxemia. However, the literature on variations of neomalthianism is vast, interesting, and has investment implications. Climate change, to be sure, but the average punter has no idea how critical phosphorus is to their life, or how and why liquid hydrocarbon production will peak around 2021. I have been pondering a beret recently. I don't have a great relationship with hats and need to try something new. There's a woman on my bus who wears one quite well. Any considerations about style or fit? Occasionally wearing a beret - a txapela in my case, a Basque beret - has significantly improved the quality of my flânerie. It's a loose, nonchalant fit, perfect for wearing it in different ways, as Sanpaku too describes. The only downside is it pretty much ruins my hairdo for remainder of the day, but there are enough days where wearing a beret outdoes that negative. I have no hairdo to ruin. I have no hairdo to ruin either but I still have a head to keep warm/dry. I can honestly appreciate the notion of having no hairdo being liberating in this sense tbh. Get thee some headwear, baldies! My kid likes wearing a big fedora, some people take the piss out of him but he looks cool imo. With his autism - big hats help him self-regulate when he's getting stressed and he has permission to wear it in lessons at school if needed. That's wonderful. I think it can be very helpful as part of a routine, esp when routine is of itself a very important thing. Plus, and I mean this, nearly everyone looks cool with a beret or fedora! I was thinking 'almost no-one' myself. Since I've started wearing a beret I have learned to appreciate the effort all the more. Though it might be a self-defense mechanism thinking it looks good on most people, reassuring myself I too look good in it. I'd go as far as claiming that a weathered fedora as part of a decades-old rumpled thrift store two sizes too big business suit ensemble is a good look, but I'd be wary of going much further than that. I'm more concerned about looking like a Mythbusters stunt double, tbh. I just have a serious incompatibility with every hat I've ever tried on, but as a bald person, my dermatologist has emphasized that I really should be wearing one. how's life, have you worn a toque, those seem to work for the shape of any head. why did your derm advise wearing a hat if you don't mind me asking? Toques are ok, but can be somewhat unsatisfying. It's like a head sock. I should be wearing a hat if I'm spending a lot of time outdoors and want to avoid skin cancer, he says. I wear a beret in fall and winter; occasionally I get compliments but I'm sure it grinds someone's gears. I rather liked seeing the preppy granddad types in Georgetown wearing wool coats and fedoras. I suppose this winter was peak fedora? Update: some of the preppy granddad types this summer are wearing straw fedoras (and trilbies, but let's overlook such abominations). I saw one old boy wearing a boater, but he was associated with something called the Art Deco Society of Washington.